Wow! What a modern technological and elegant beauty! 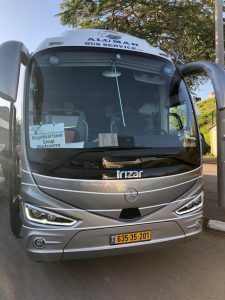 Our brand new 2019 Mercedes bus in Israel! Beats the camels of olden days. Nothing but the best for our pilgrims! Thanks, David and Amer for providing the absolute best services for the best of all pilgrims!